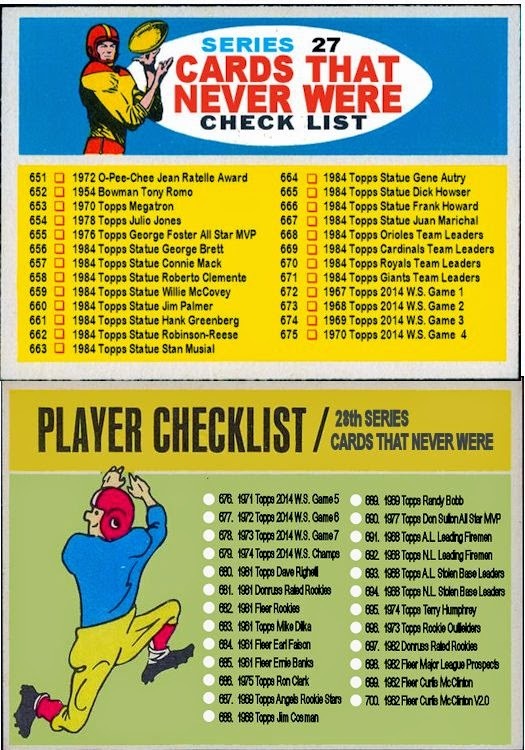 Here is the 1958 edition of my recurring theme putting the ROY's on the 1975 Topps MVP cards. Once again with more series and a larger set, Topps managed to produce cards for both Rookie of the Year players in 1958. Albie Pearson struggled after his rookie year and was traded to Baltimore. 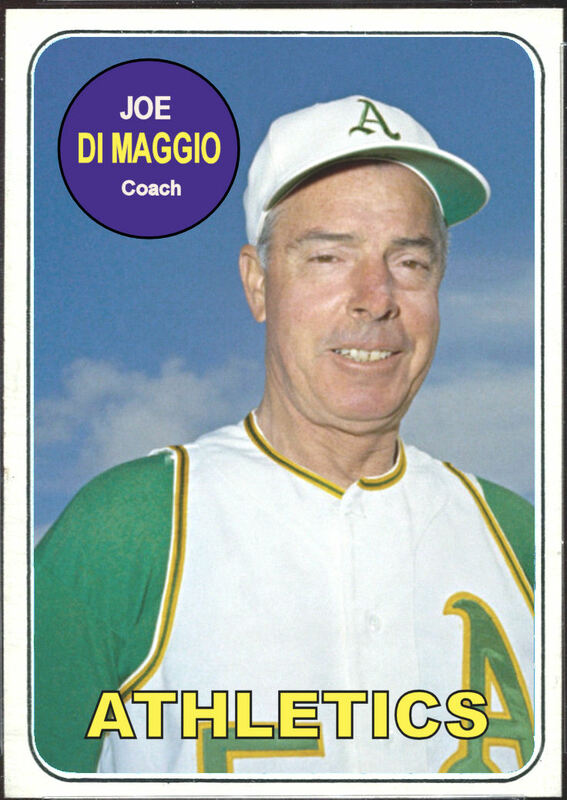 In 1960 he was selected in the expansion draft by the L.A. Angels where he got back on track. 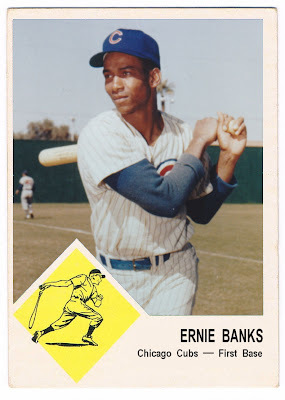 He was the starting centerfielder on the 1963 A.L. All Star Team and went 2 for 4 with a double and a run scored. 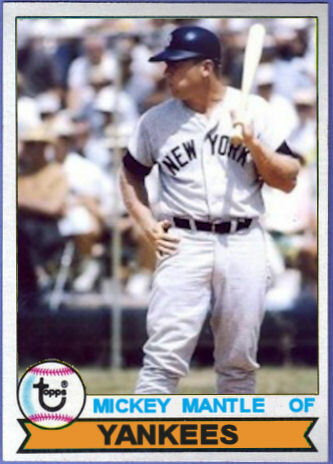 He retired in 1966 with back ailments. 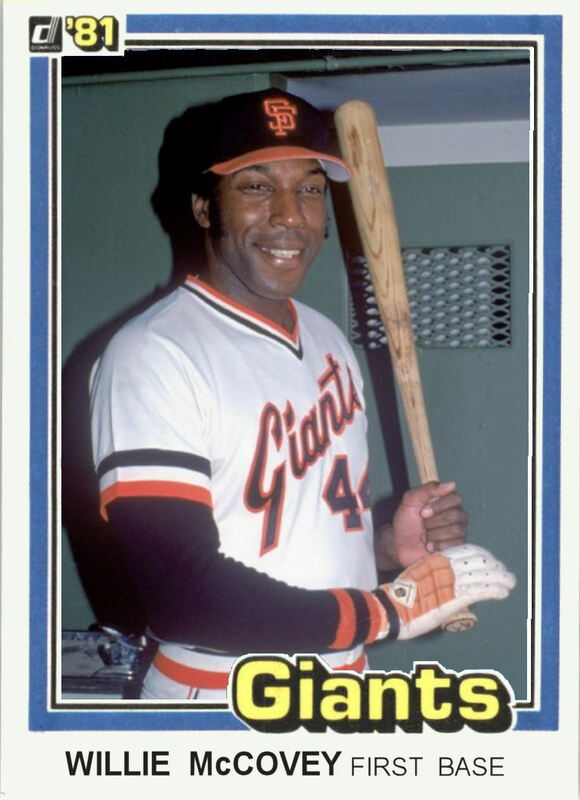 Orlando Cepeda went on to a Hall of Fame career. 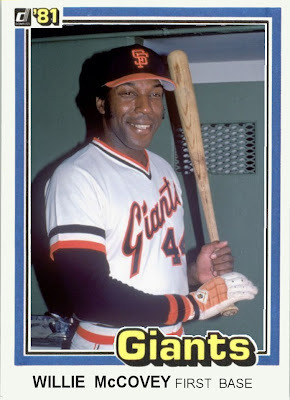 He played for the Giants, Cardinals, Braves, A's, Red Sox and Royals, had 7 All Star seasons and won the M.L. 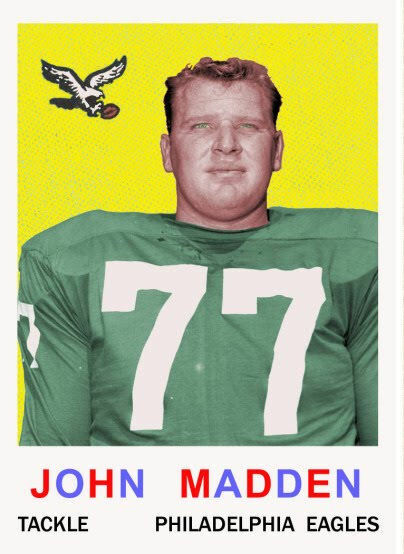 MVP in 1967. 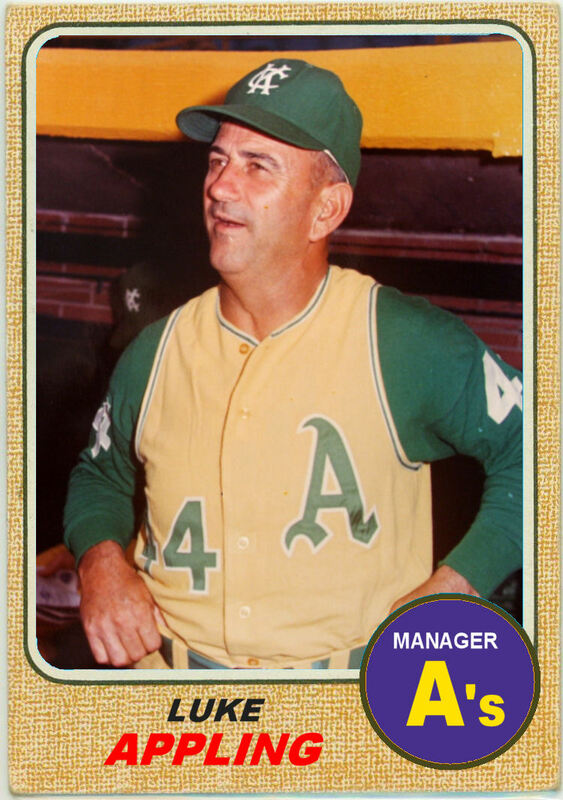 He retired in 1974 but if the AL hadn't added the designated hitter his career might have ended with the Oakland A's in 1972. 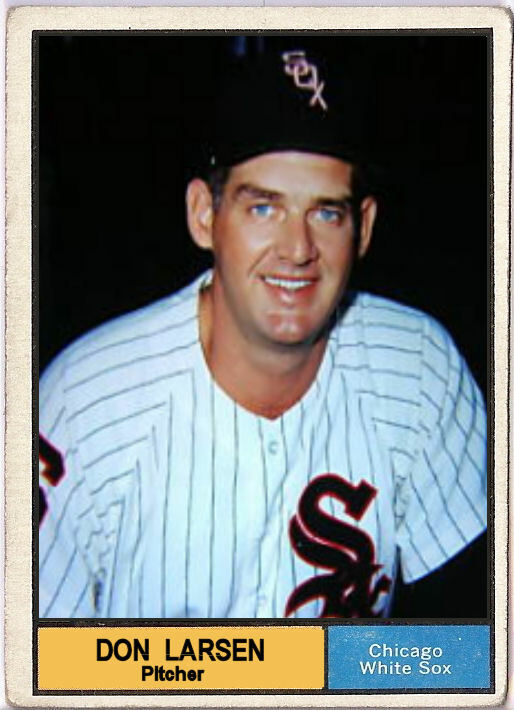 A few months ago I posted a 1967 Don Larsen card in a Cubs uniform. 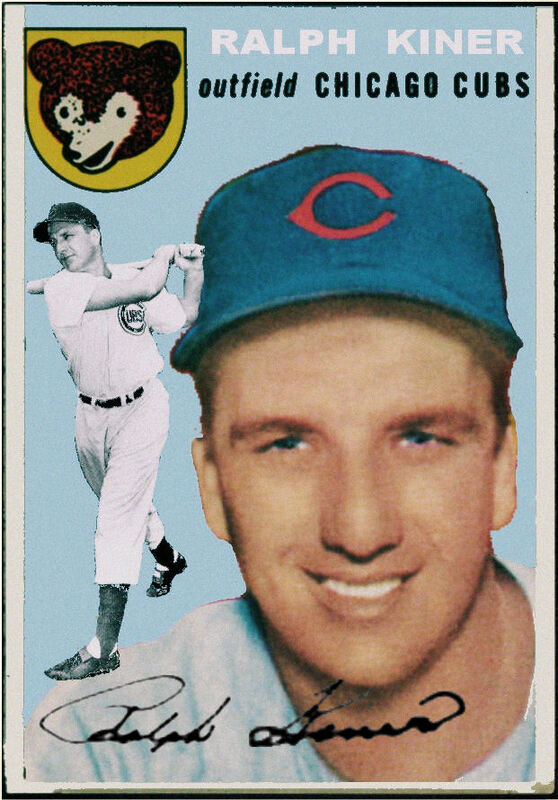 He also played on the South side of town. In June of 1961 he was traded from the Kansas City Athletics to the White Sox in an 8 man trade. 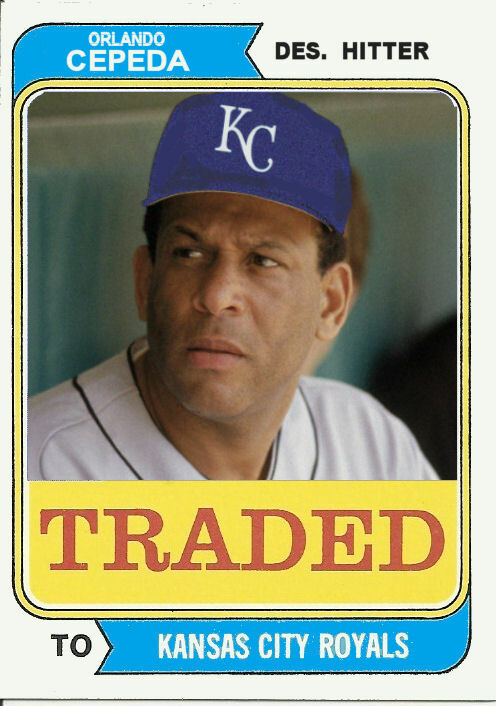 By November he was traded to the Giants as part of a 6 man trade. As a result he never appeared on a Topps card as a White Sox player. In 1961 his card had him on the Athletics and in 1962 his card had him on the Giants. 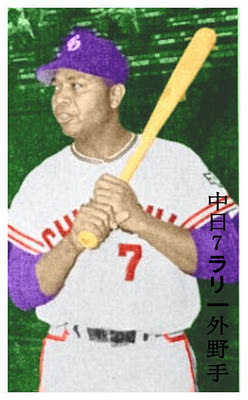 I found a black and white photo of Larry Doby in his uniform for the Chunichi Dragons and felt compelled to turn it into a card. 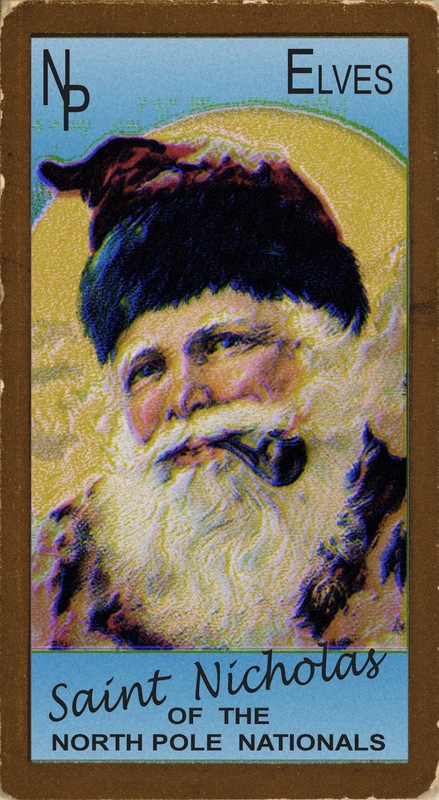 This is a fairly decent representation of a 1963 Menko card. 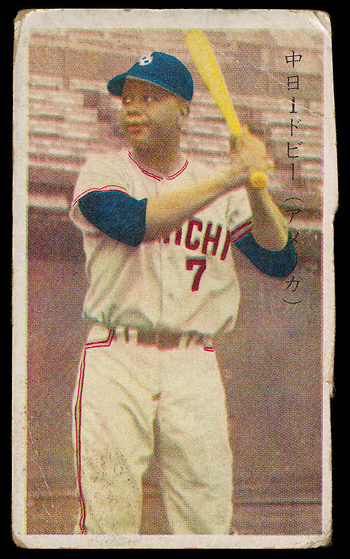 The characters on the right are from top to bottom: Chunichi (2 Characters), 7 (his uniform number), Larry (3 characters), Outfielder (3 characters). 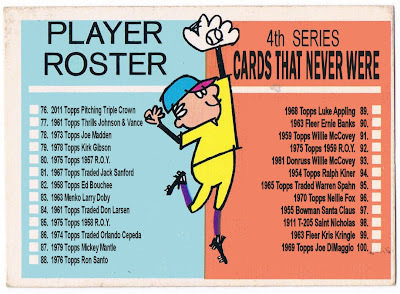 The cards themselves were 1 13/16" x 3" and had baseball related drawings on the back. 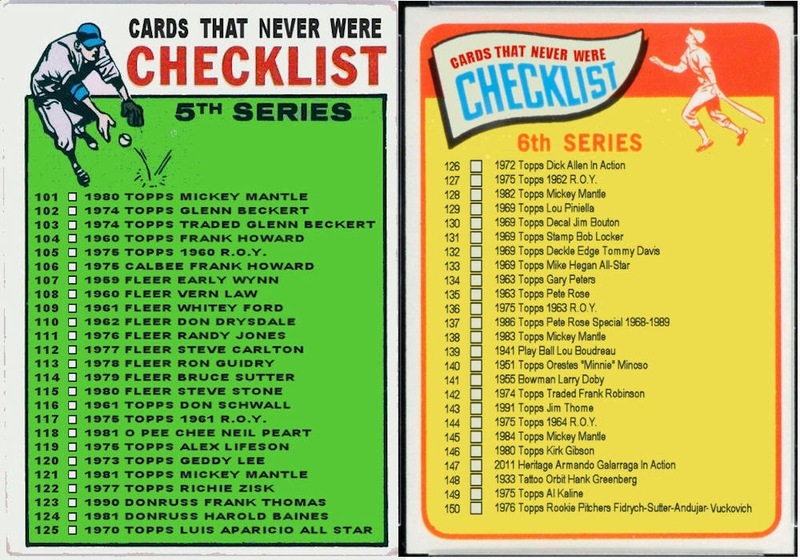 They were meant to be used for flipping which some of us older guys remember doing to our cards as kids. Doby played for the Dragons in 1962 along with Don Newcombe who was the NL MVP and Cy Young award winner in 1956. 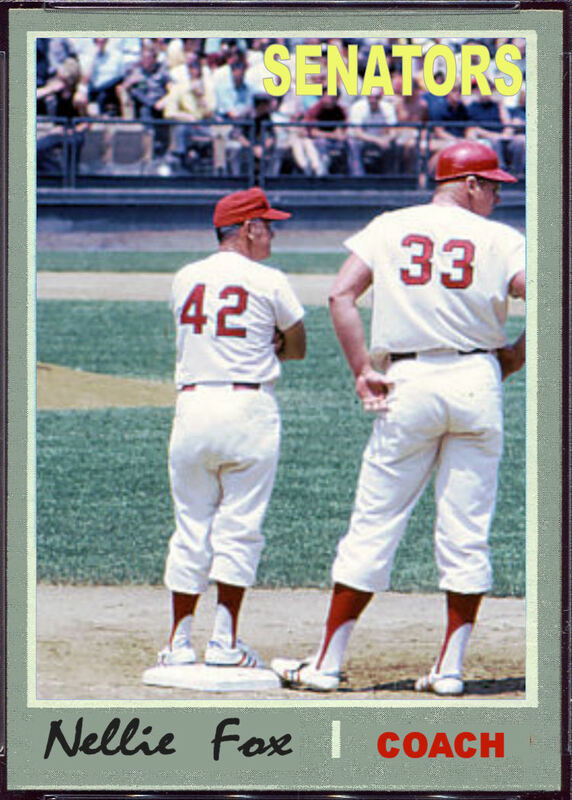 Newcombe played 1st base for the Dragons instead of pitching. 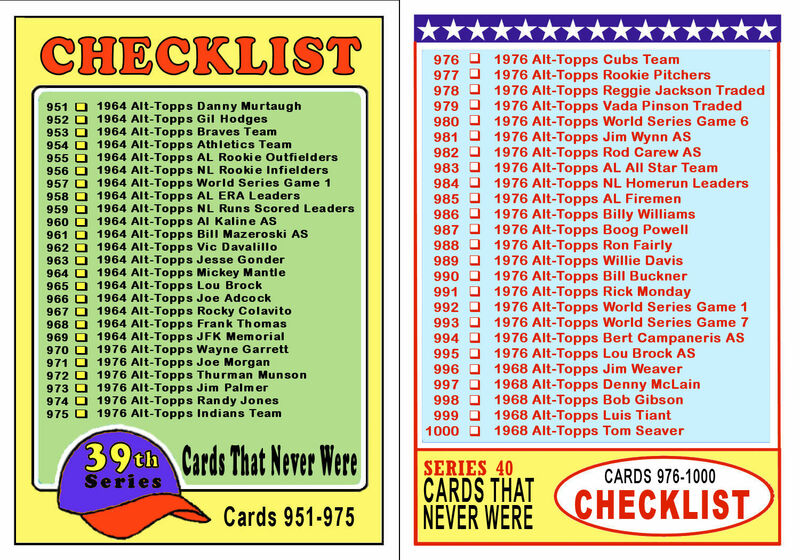 Doby did have a 1962 Menko card which is why I made mine in the 1963 style. This card recently sold at Prestige Collectibles for $486. As you can see by the original that my crappy colorizing fits right in with the originals. 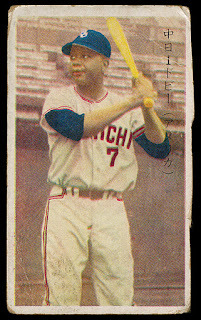 You can also see the beating this card took as it was probably used the way it was intended, kids flipped and traded it. 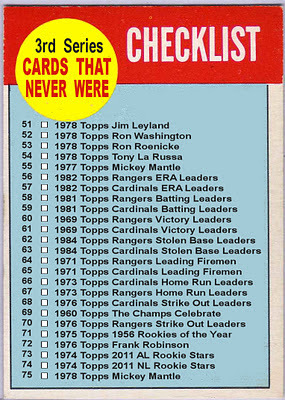 Cards 51-75 plus the 3rd checklist. 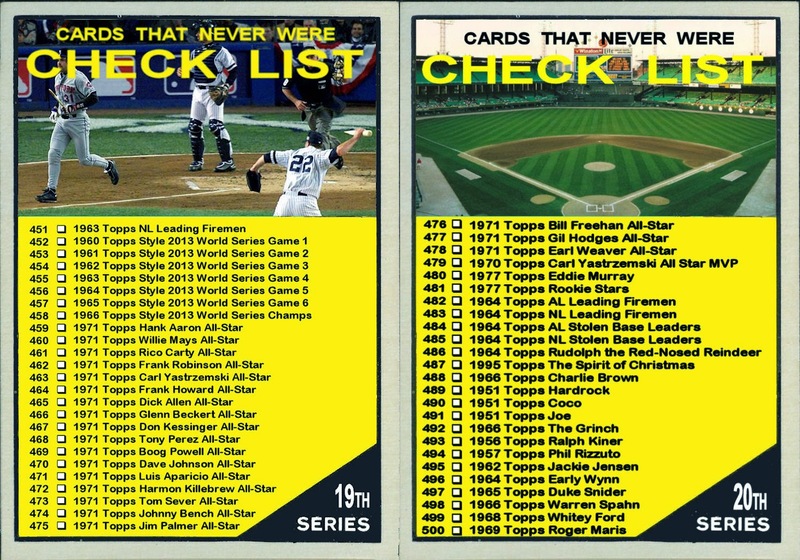 Most of these cards are multiplayer post season cards and every one of them is based on a Topps design. Next series will have more variety, I promise. 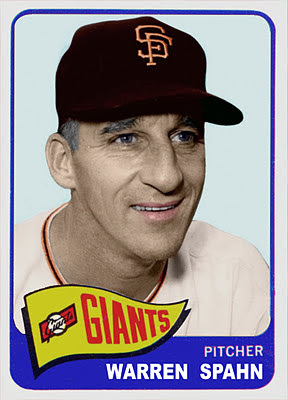 In 1957 Ed Bouchee came in second place to his teammate Jack Sanford for Rookie of the Year and was co-winner of the Sporting News Rookie of the Year along with Sanford. 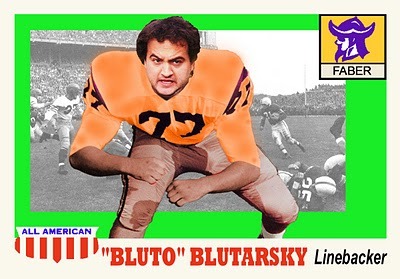 After the '57 season Ed ran into some legal problems. In 1958 Topps had him slated for card #145. 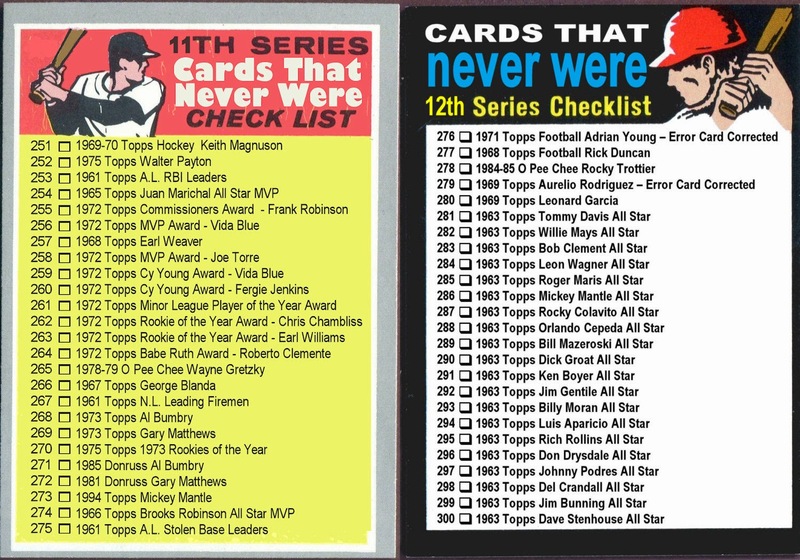 That card was never printed and may not have even been made. There are rumors of its existence but I have never seen it. 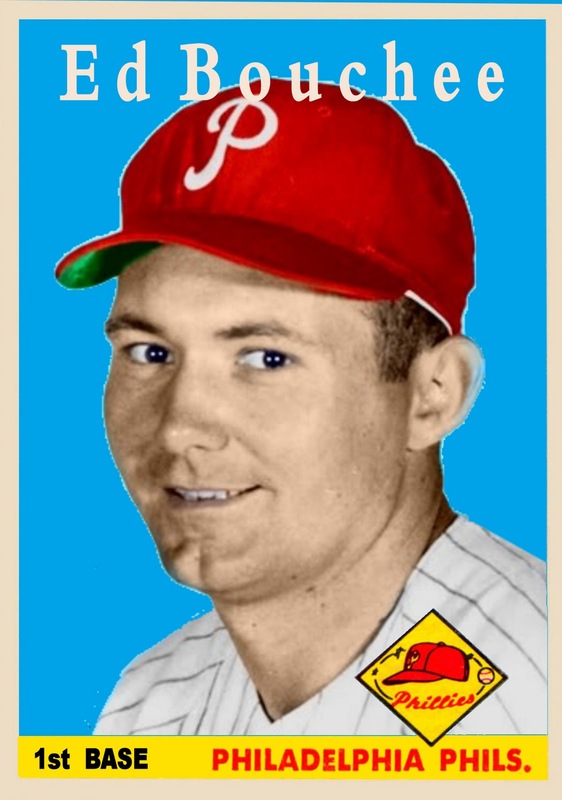 Jack Sanford started his career beating out Phillies teammate Ed Bouchee for Rookie of the Year in 1957. His career ended when he was released by the Kansas City Athletics in August of 1967. He started the 1967 season on the Angels and appeared in the 1967 Topps set in an Angels uniform. 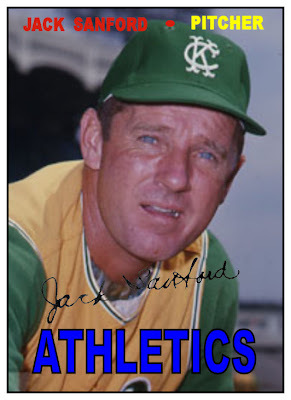 I played with the idea of making a 1968 card of Sanford on the A's but decided on 1967 because he was released before the season ended. 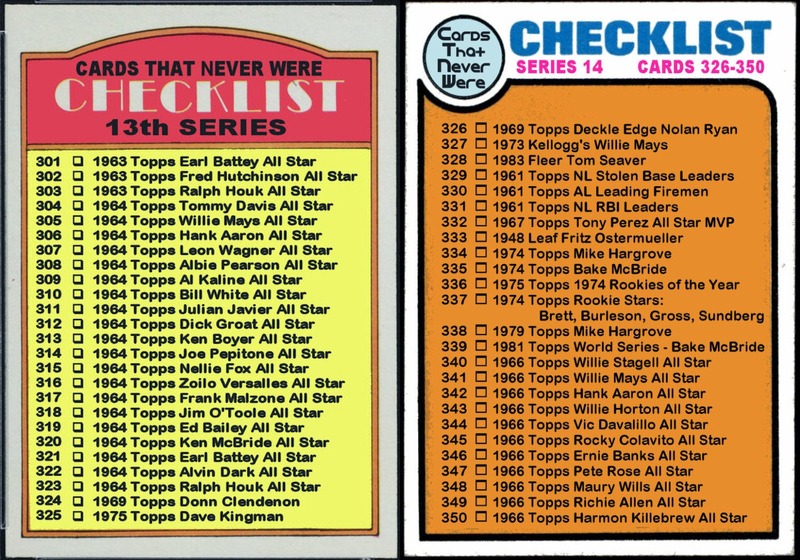 In 1957 Topps had 5 series and 407 cards. 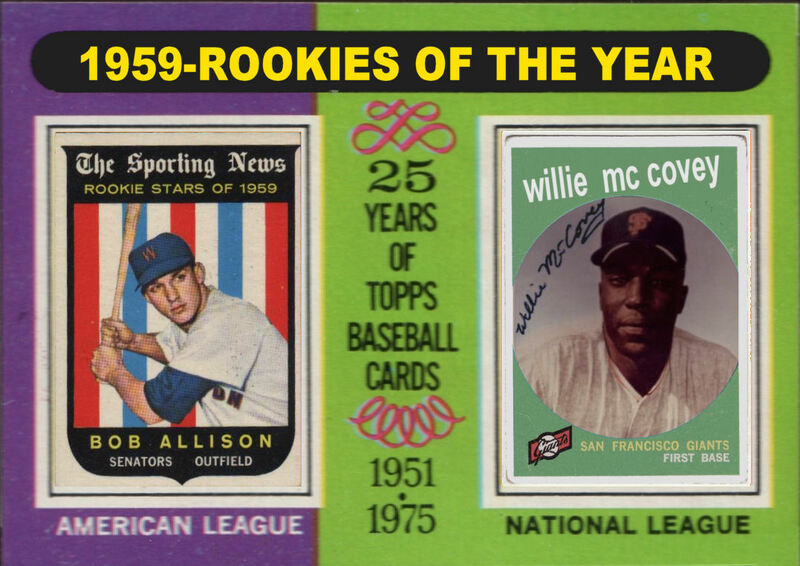 The most since 1952 and for the first time both Rookies of the Year had Topps cards issued in the original set. 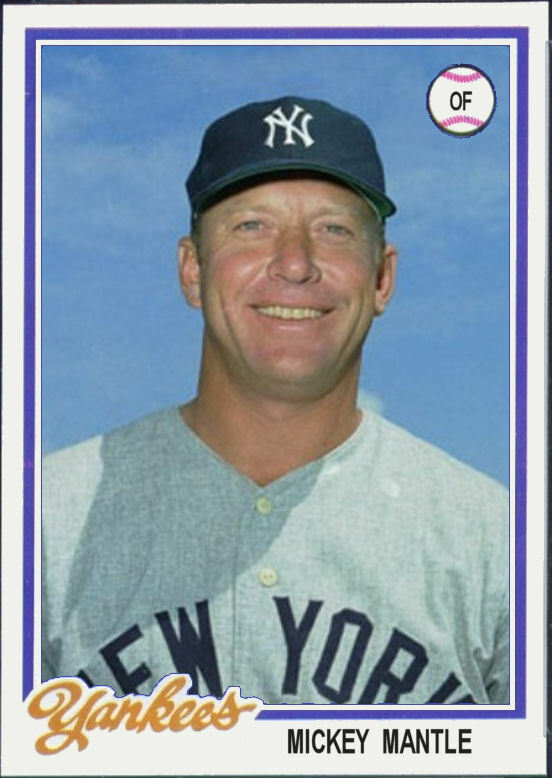 Tony Kubek played his entire 9 year career win the Yankees. He then went on to Broadcast on NBC until 1989 then locally for the Yankees until 1994. In 2009 he was awarded the Ford C. Frick award for Broadcasting by the Hall of Fame. 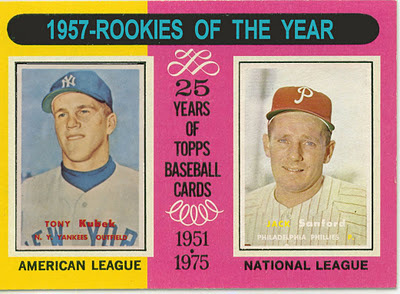 Jack Sanford beat out Phillies teammate Ed Bouchee for the Rookie of the Year. He led the league in Strikeouts and had 19 wins. 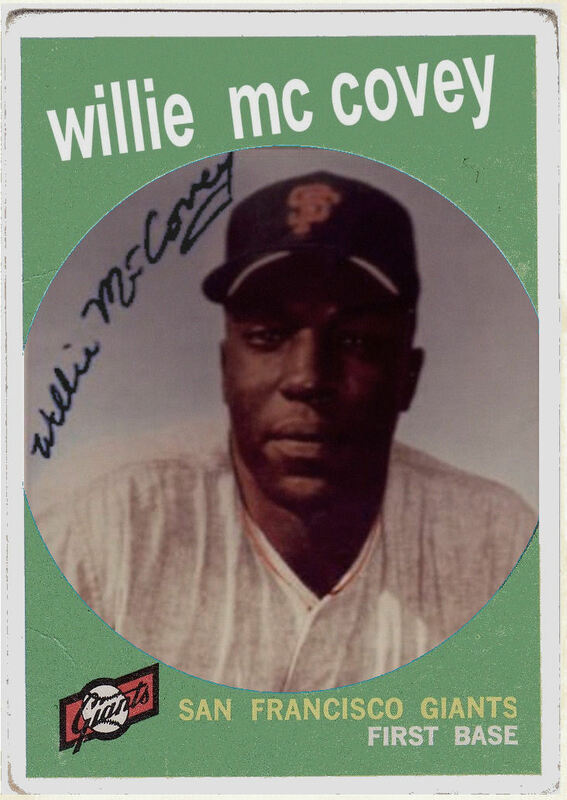 He would go on to play for the Giants, the Angels and the Athletics until 1967. The selection of 2011 Managers of the year surprised no one. 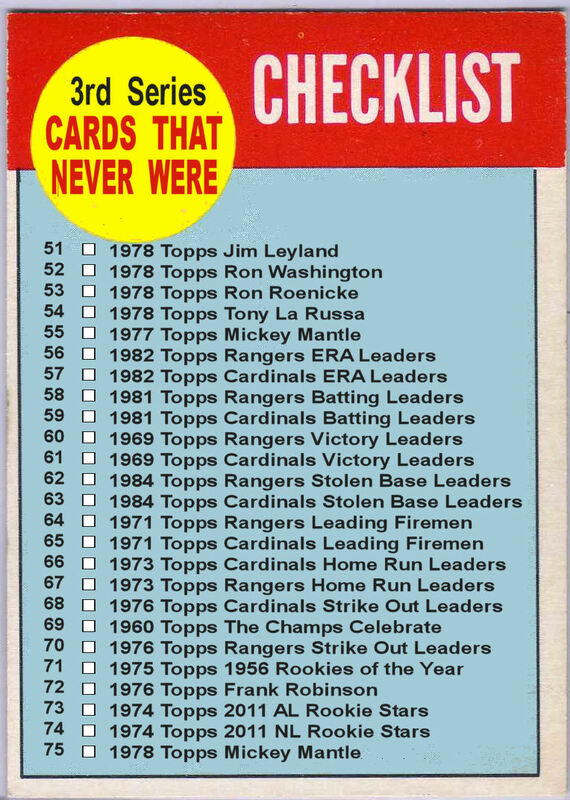 Madden and Gibson were the favorites but I had a sneaky feeling that LaRussa would somehow get the nod out of sentimentality. 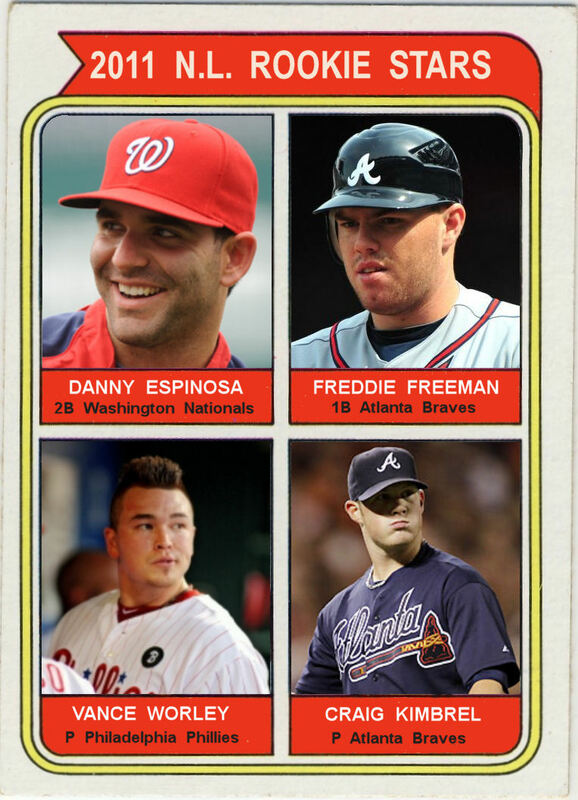 I have to admit the Gibson card was made for the NL Championship Series but never got posted because they were eliminated. But the Madden card is freshly made. 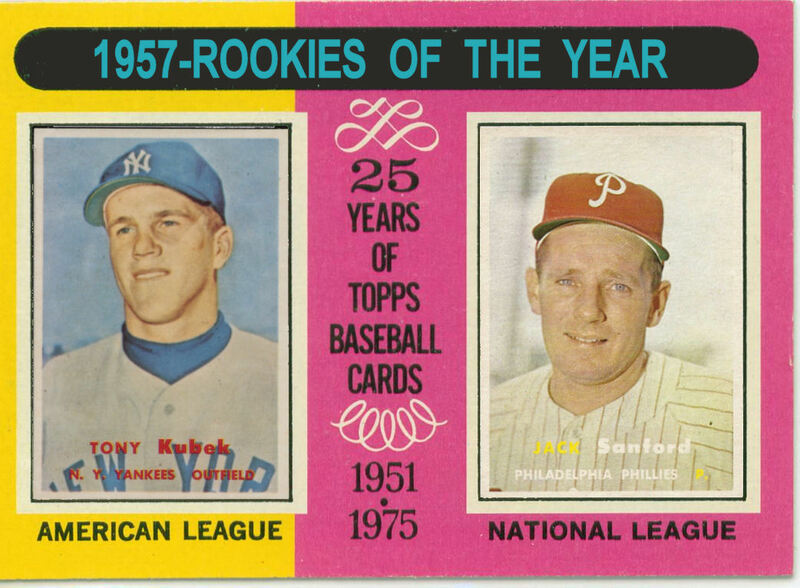 I posted these cards last week of what I perceived to be the favorites in the Rookie of the Year running. I also posted a poll asking who you though should win the ROY. For the National League Kimbrel won the poll and also the Rookie of the Year award. In the AL the winner was Jeremy Helickson but I never put him on the Rookie Stars card or include him in the AL poll. There was one vote for "Other" but whoever cast that vote didn't leave a comment. The last time pitchers from both the National League and American League won the Triple Crown was 1924. 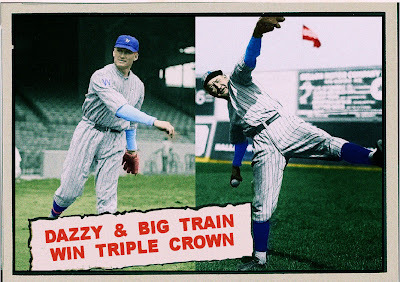 Hall of Famer Walter Johnson led the A.L. 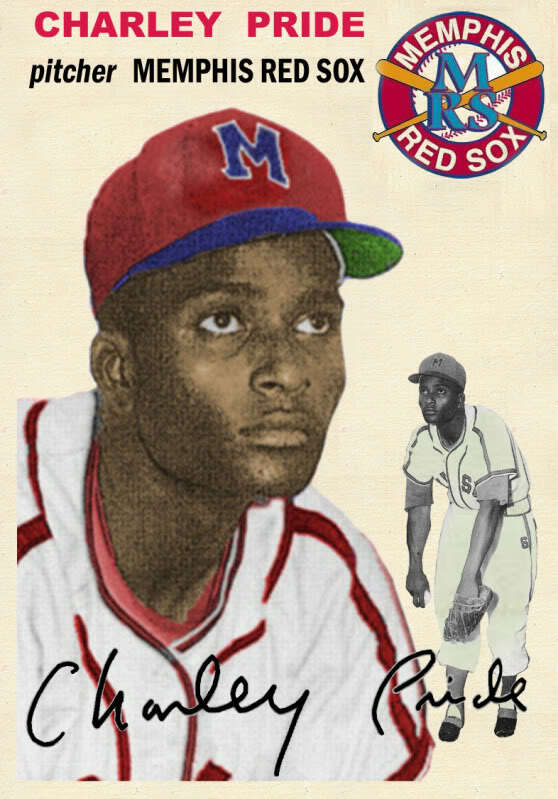 with 23 wins 158 strikeouts and an ERA of 2.72 for the World Series Champion Washington Senators. Another Hall of Famer, Dazzy Vance had 28 wins 262 strikeouts and an ERA of 2.16 for the Brooklyn Robins who came in 2nd in the N.L. The Cy Young Awards will be announced this week. 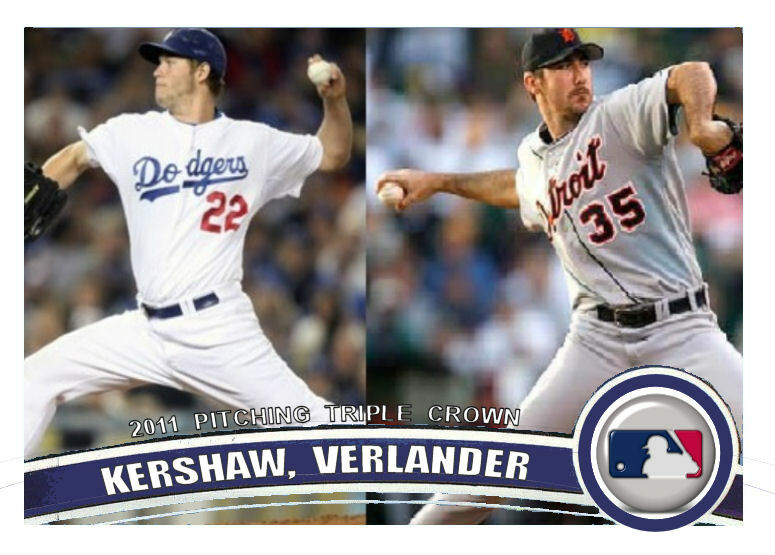 Justin Verlander and Clayton Kershaw both led their respective leagues in victories, strikeouts and ERA, the pitcher's equivalent of the triple crown. Does this make the shoo-ins for the Cy Young award? 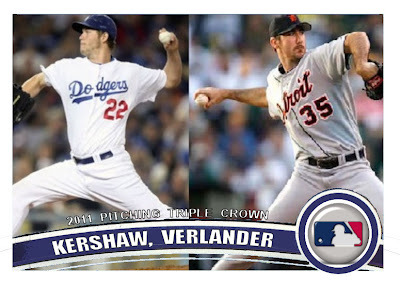 I think Verlander will be the unanimous winner but Kershaw has some competition. 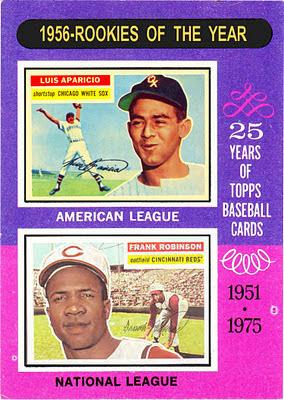 Since the creation of the Cy Young Award in 1956, no triple crown winner was denied the award. 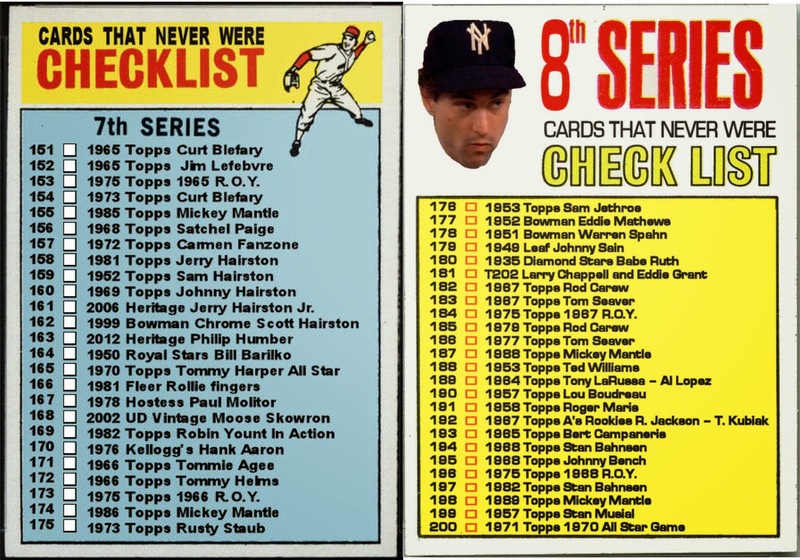 The last time there was both an American League and National League triple crown winner was in 1924. 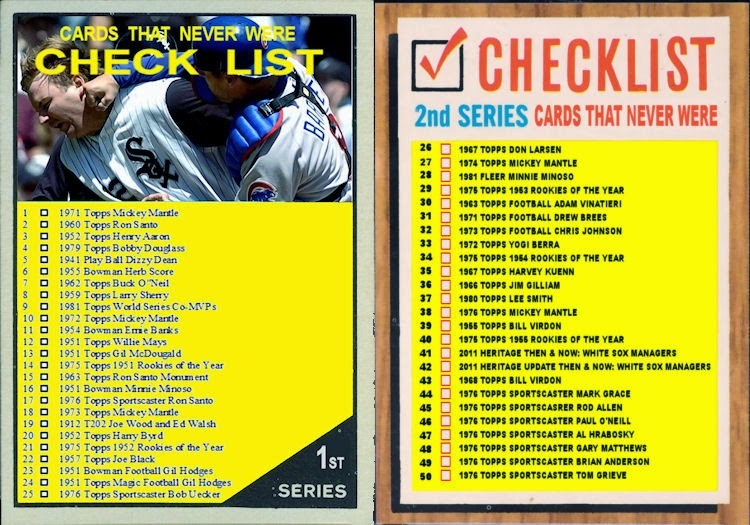 Here is my 3rd checklist already. 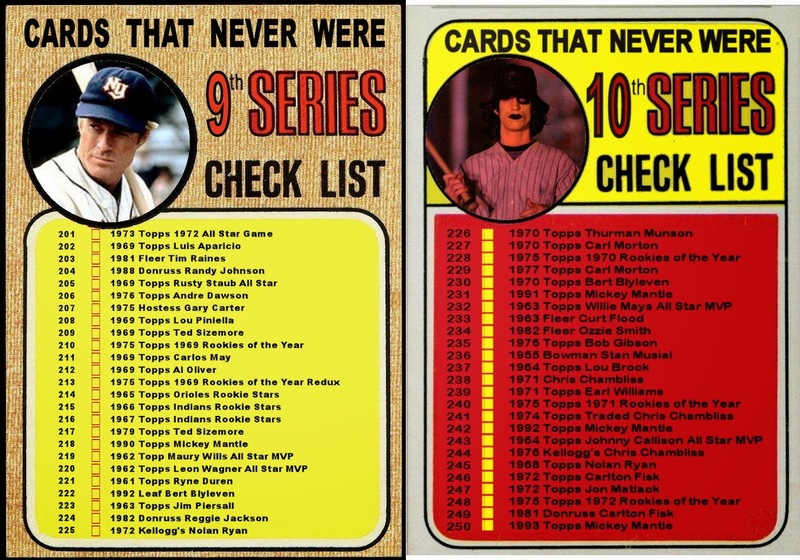 This one went by even faster with all of the playoff and World Series cards. 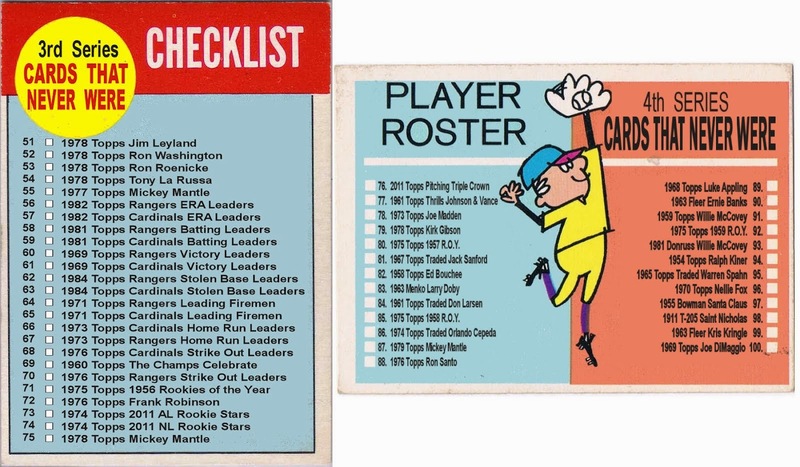 As far as checklists go, the 1963 Topps was pretty bland. 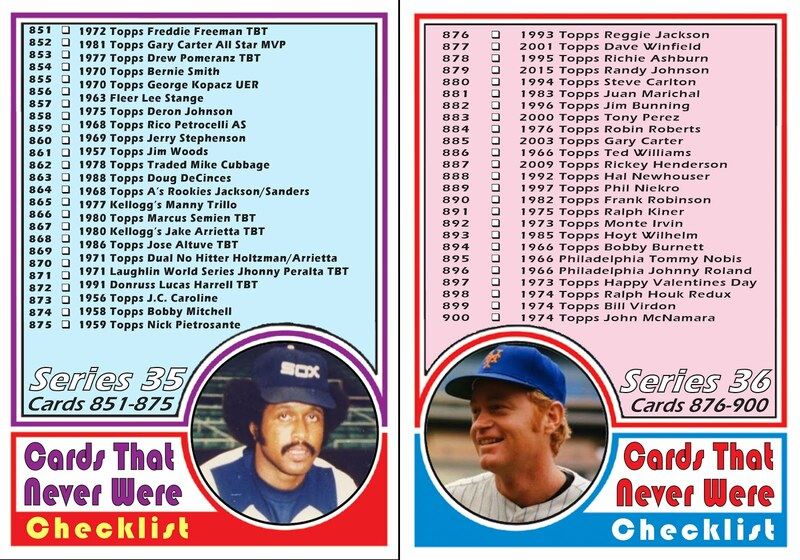 Also this was the first time all 25 cards that I made used Topps Baseball format. 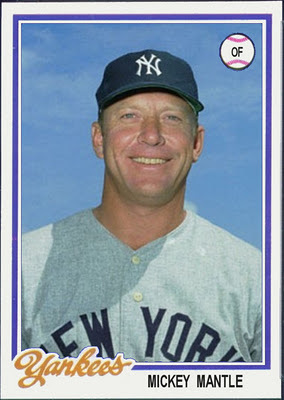 Mantle played his final game in 1968 and yet here I am making a 1978 Mickey Mantle card. 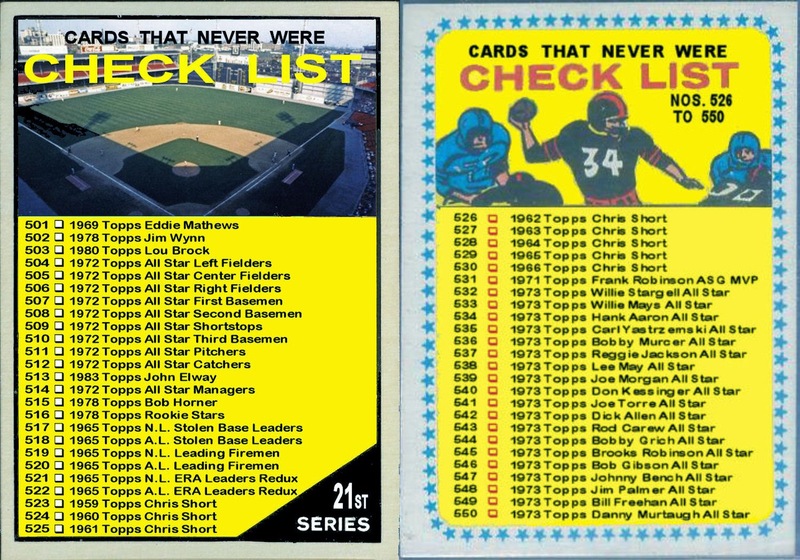 From 1971 on it seem as though more and more action or candid shots made their way onto cards. 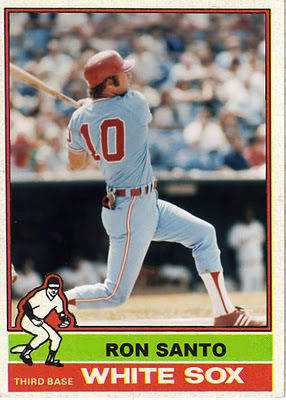 In 1978 Topps seemed to feature a lot of posed head-shots. 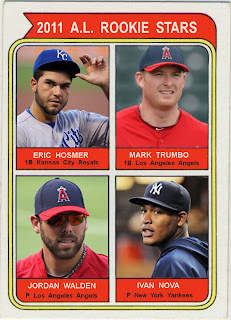 A week from today MLB will announce the 2011 Rookies of the Year. 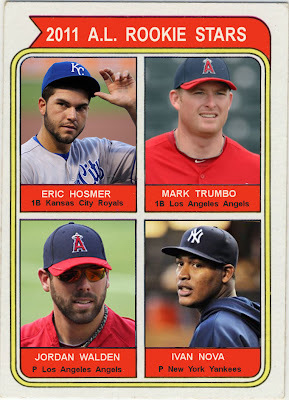 Using the same 1974 Topps Rookie format, I put together 4 on the top National League rookies. I am also posting a poll in the side-bar. Let me know who you think should win the N.L. Rookie of the Year. 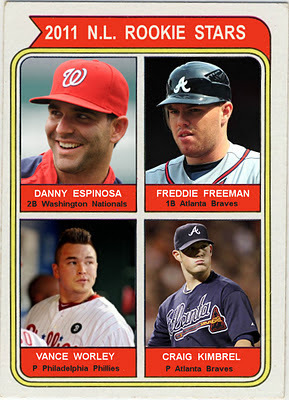 Next Monday MLB will announce the Rookies of the Year for 2011. 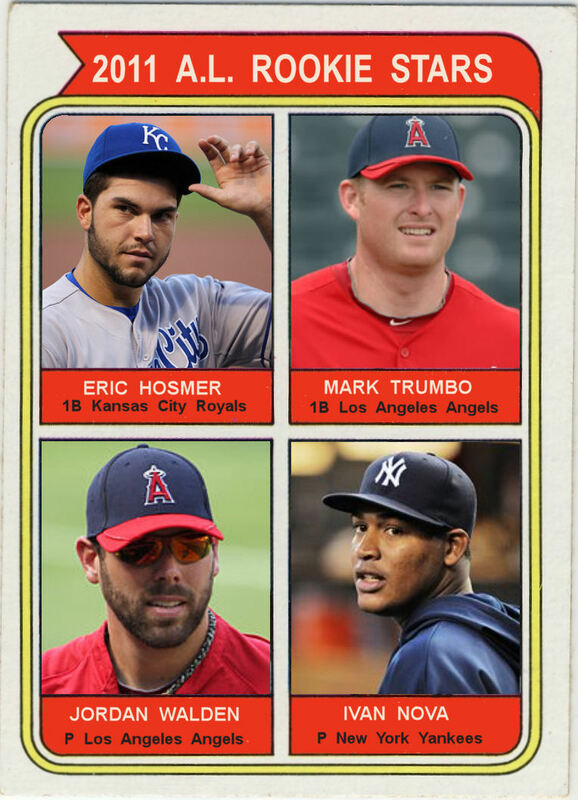 Borrowing from the 1974 Topps rookie cards, here are 4 of the top AL rookies. I am also posting a poll in the side-bar. Let me know who you think should win the A.L. Rookie of the Year. 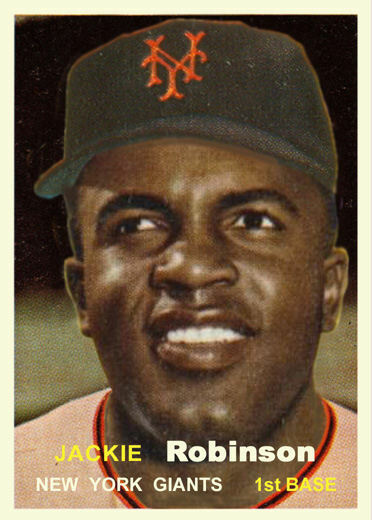 After winning the Rookie of the Year award in 1956 Robinson continued to play until 1976. 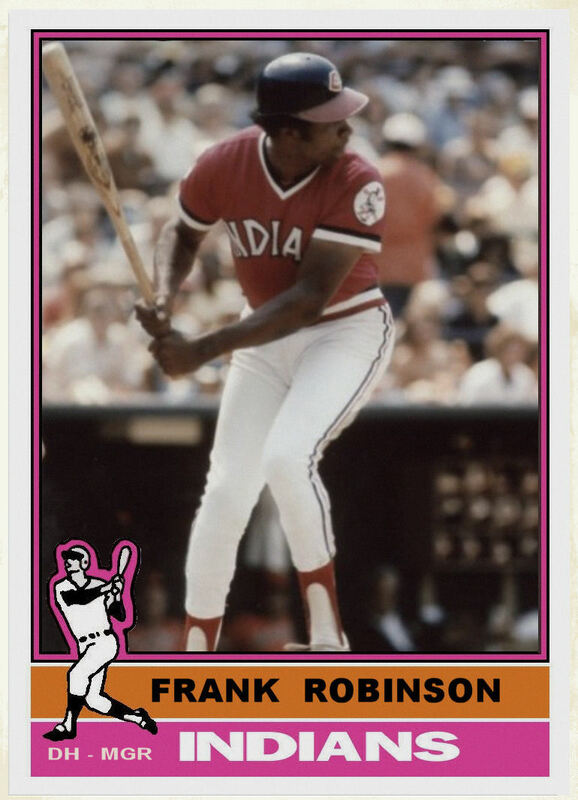 Robinson appeared on the 1976 Topps Indians team card in the lower right corner as the manager but he did not have a regular player card even though he appeared in 49 games in 1975 and 36 in 1976. 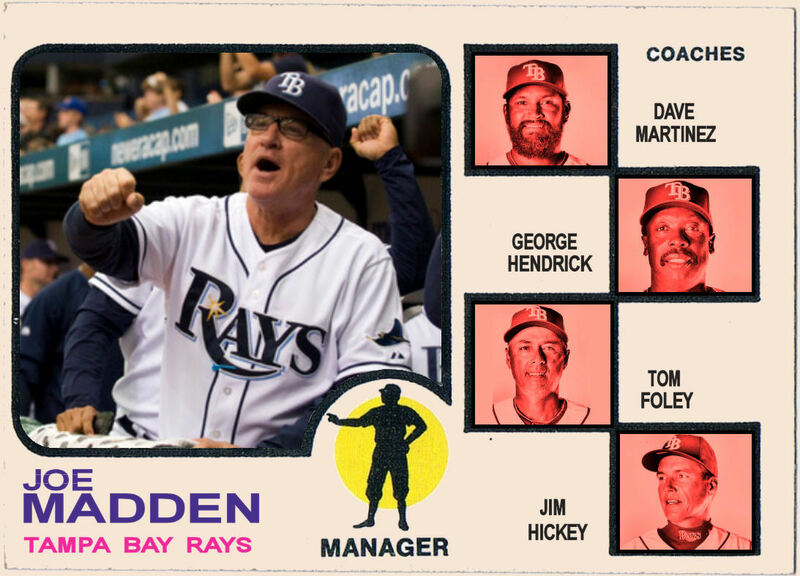 The Hall of Famer continued to appear in various sets as a manger until 2006. Now that the post-season is over I can return to some of my recurring themes. Here is the 1956 edition giving the Rookies of the Year the same treatment Topps gave the MVPs in 1975. 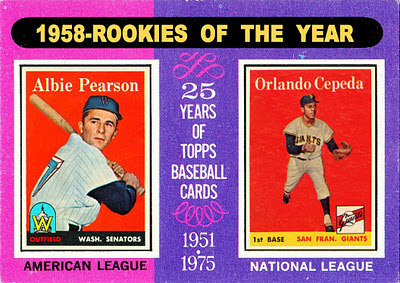 1956 is the first year that both Rookies of the Year went on to Hall of Fame careers. While Luis Aparicio had a card in the 1956 Topps set, Frank Robinson first appeared on a Topps card in 1957. The Robinson card I included here was produced by Topps and given away in VIP packages at the 2006 National Sports Card convention. I actually have one problem with this card. 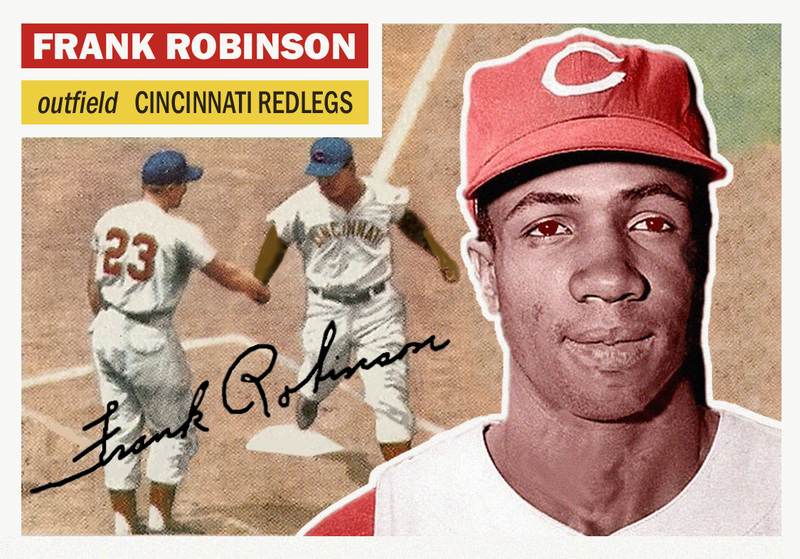 In 1956 the team was officially called the Redlegs. This was the height of the McCarthy era and the Reds changed names rather than be confused with communists. As ridiculous as it was to change the name, it seems disingenuous to ignore the name change on a reissue. 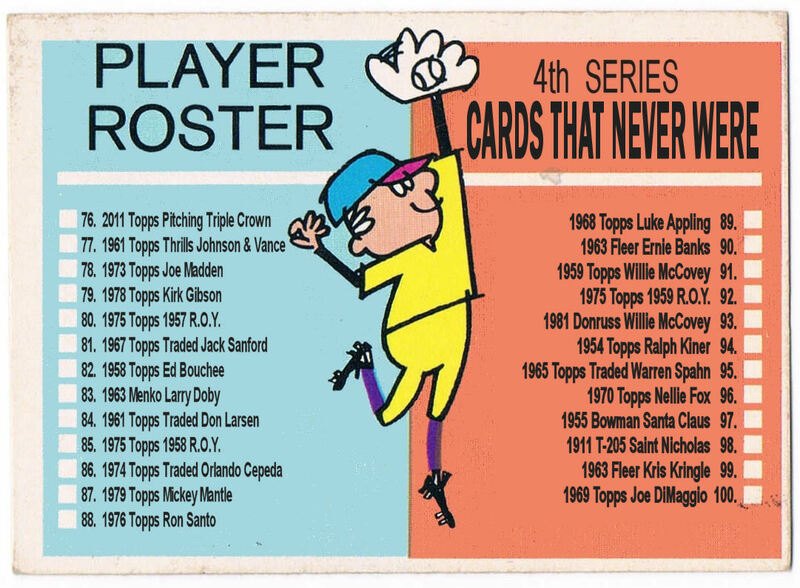 A few days ago I include Bob Lemke's version of Robinson' "rookie" card. His properly identified the team as Redlegs. Check it out. 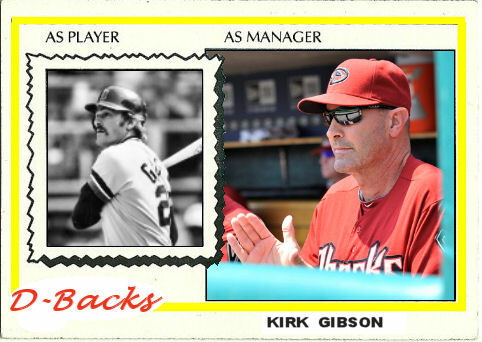 Since I made one for the Cardinals, I needed to make one last franchise leader card for the Rangers. 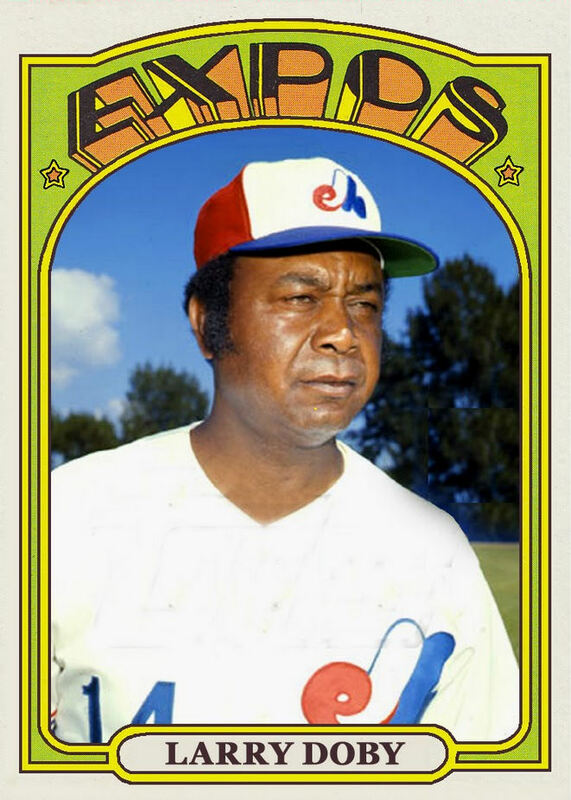 Again, I used the 1976 Topps leader format for the last card in my World Series leader theme. 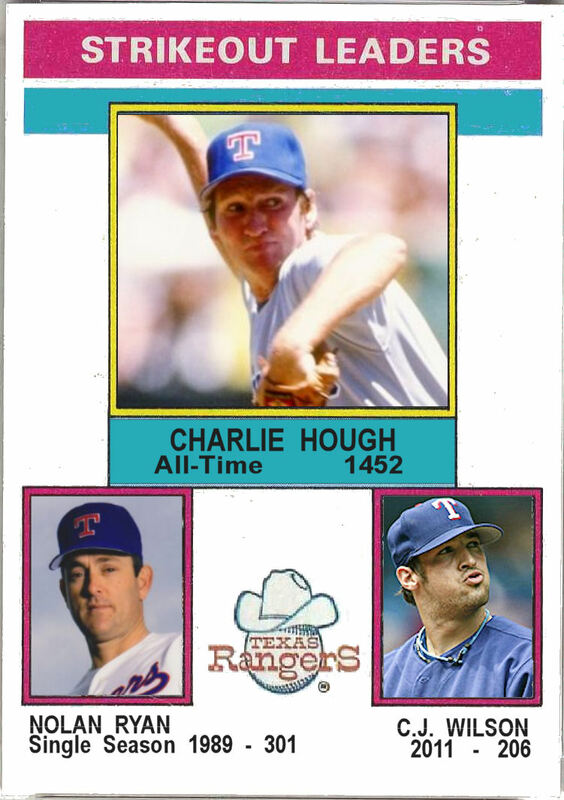 Charlie Hough leads the Rangers with 1452 all-time strikeouts. 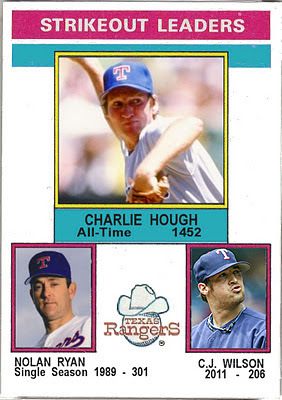 Hough made his only All Star appearance in 1986 with the Rangers. Although he had 3 strikeouts in 1 2/3rds innings, catcher Rich Gedman had a hard time with his knuckleball with a wild pitch and a passed ball leading to the NL's only runs in a 3-2 AL victory. 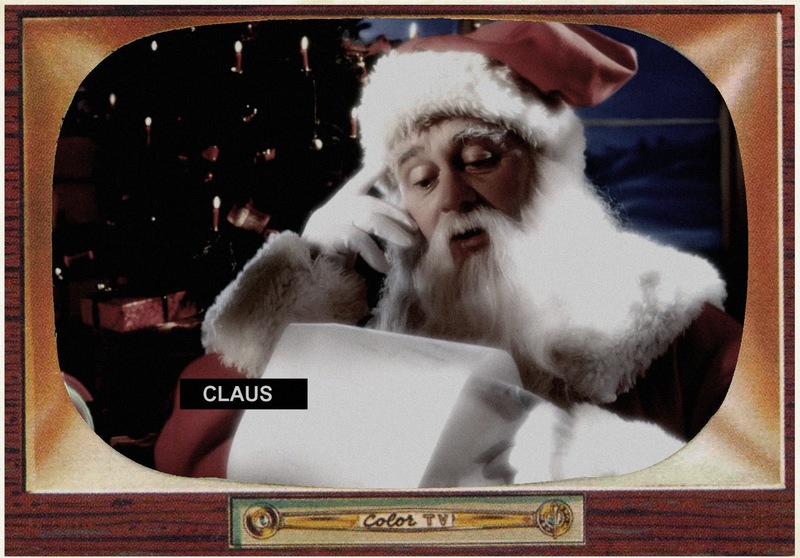 Nolan Ryan is now the Owner/President/CEO of the Texas Rangers and is shown repeatedly during telecasts of this Series. He threw the final 2 of his record 7 no-hitters in a Rangers uniform. C.J. Wilson had a career high 206 strikeouts this year. He also had 26 K's in the 2011 post-season. This is one of my favorite websites. 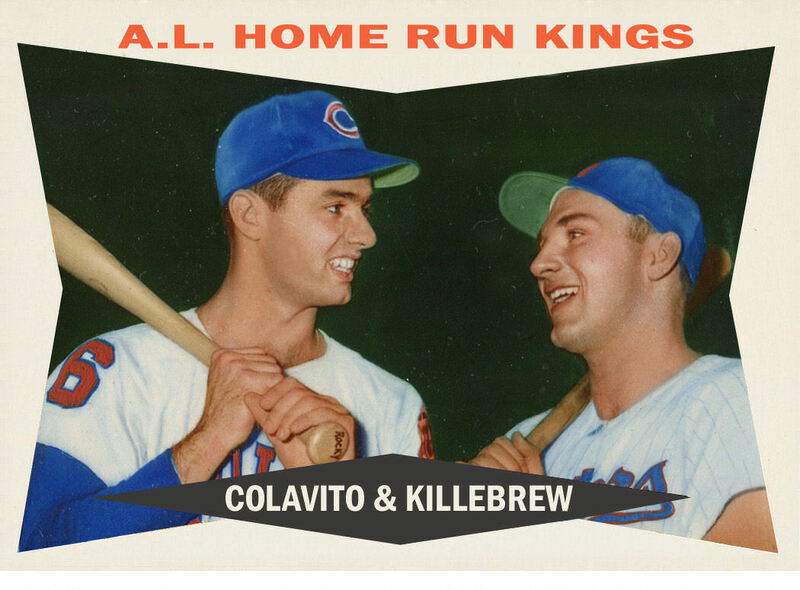 If you are a baseball card geek like I am you will recognize the name. Bob is the Editor of the Standard Catalog of Vintage Baseball Cards. 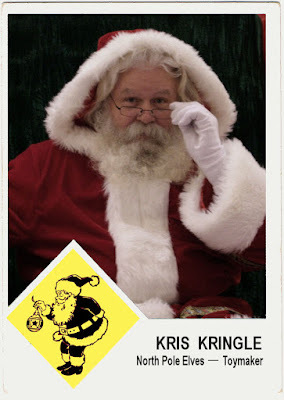 His blog is full of information and quit a few custom cards. His creations are head and shoulders above any I have seen on the web. He is obviously a perfectionist and it shows. 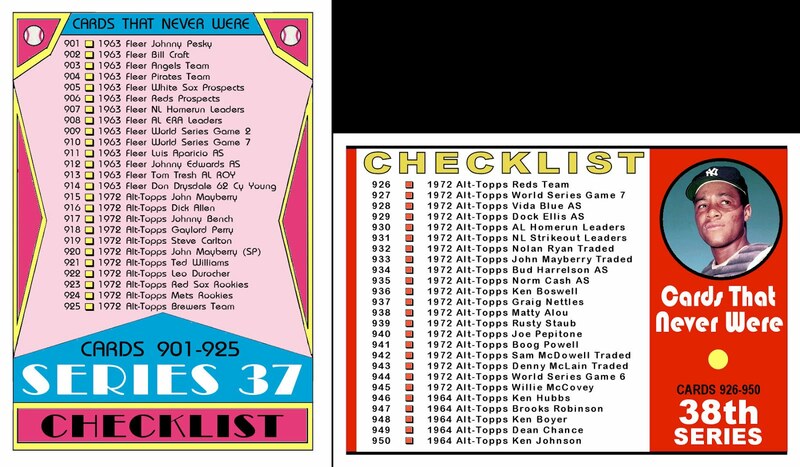 His cards all have a front and a back that is both true to the original set issue format and informative. I could (and I have) spend hours going through his blog. Also if you are so inclined, he sells a limited number of hard copies of his creations. 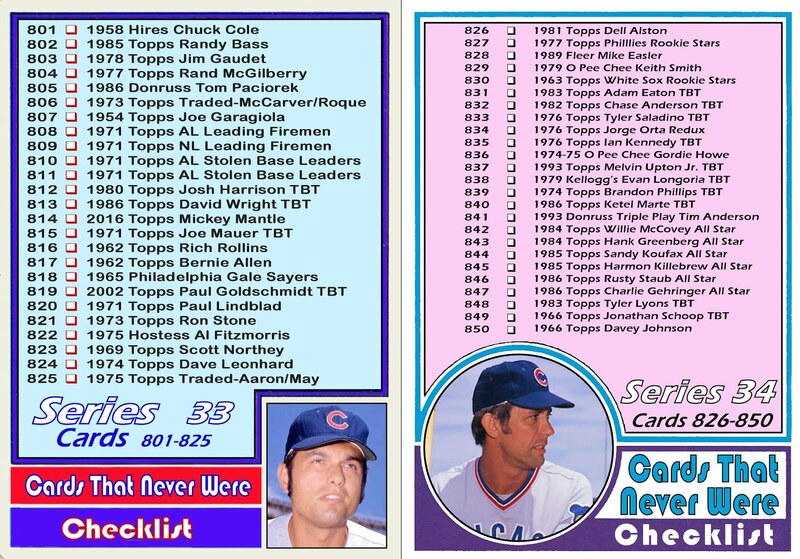 I really had a hard time narrowing down the cards to include on this page. 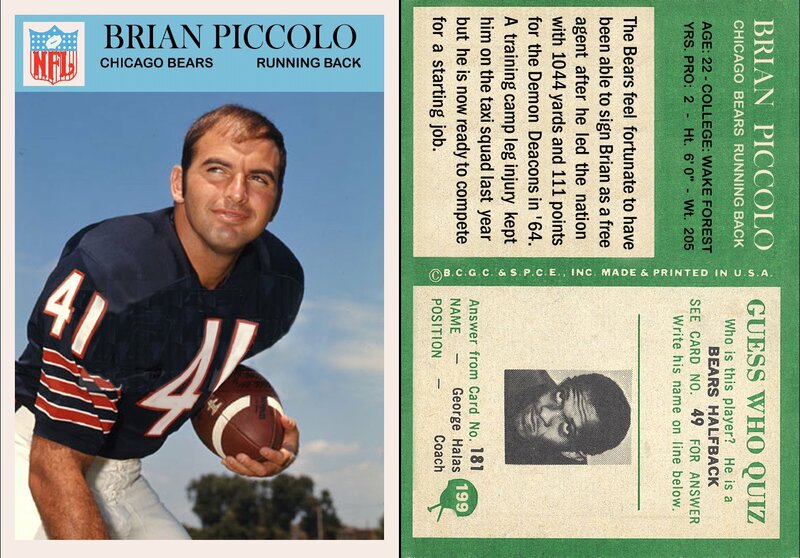 I had to include Wheaton, IL native John Belushi and Brian Piccolo (note Lemke spelled his name correctly but Topps did not). 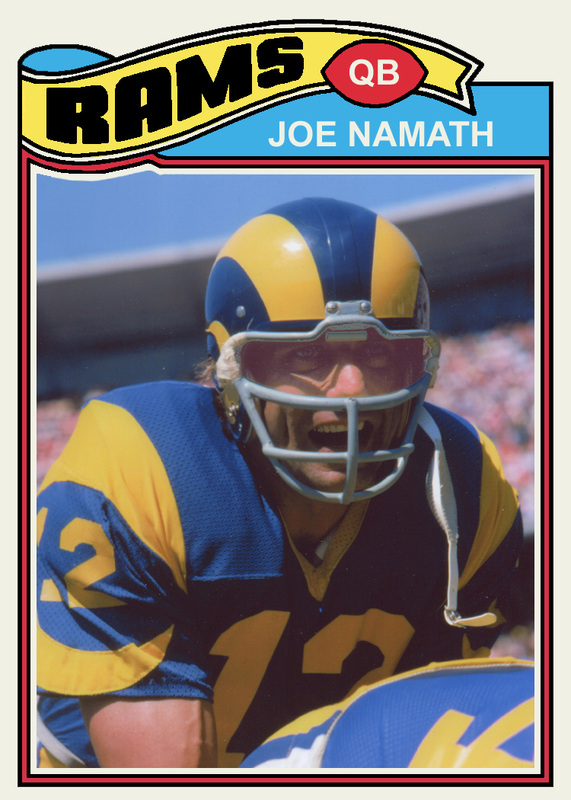 I love to see cards of famous players on unfamiliar teams (Robinson, Doby, Namath) or people who never had cards (Madden, Pride). I don't want to give away too much but go visit his blog. If you are like me, it's like being a kid in a candy store. 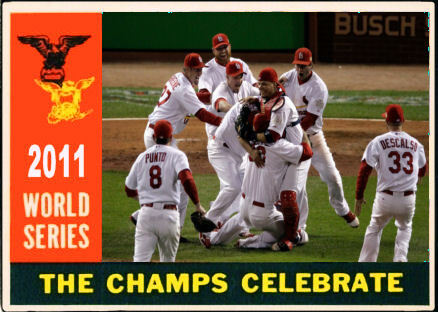 2011 Champs borrowing the 1960 Topps World Series card format. After a wild 11 inning game 6 the Cardinals have forced a game 7 in St. Louis. 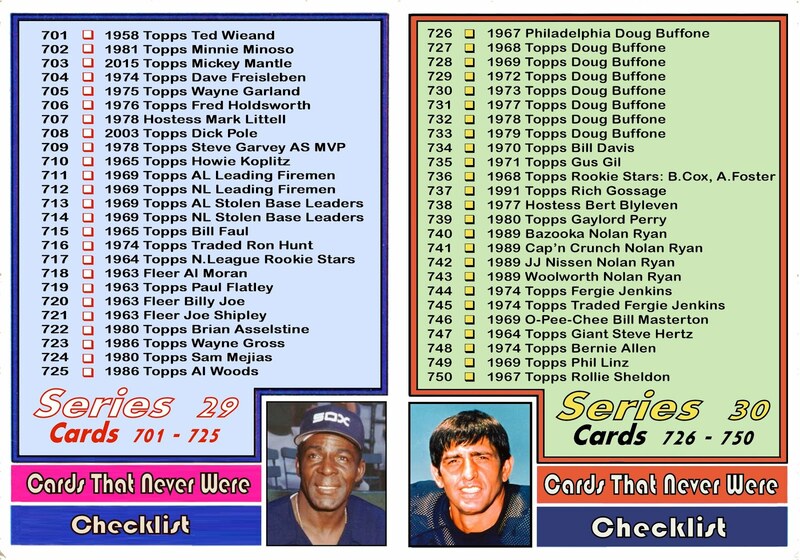 This time I used the 1976 Topps leader format in my World Series leader theme. 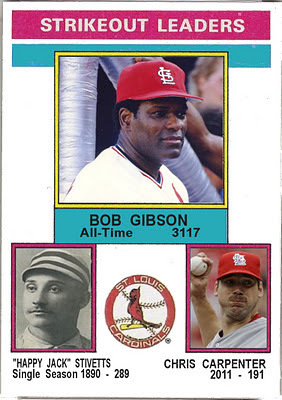 Bob Gibson the Hall of Famers 3117 strikeouts, all with the Cardinals puts him second to only Walter Johnson for total strikeouts with one team. "Happy Jack" Stivetts pitched for the St. Louis Brown Stockings from 1889-1891. During those 3 seasons he won 72 games with an ERA of 3.01. He also hit .288 with 14 homers. Chris Carpenter is rumored to start tonight's game 7 on 3 days rest. He is 3-0 in 5 appearances this post-season. This was a tricky one for me. 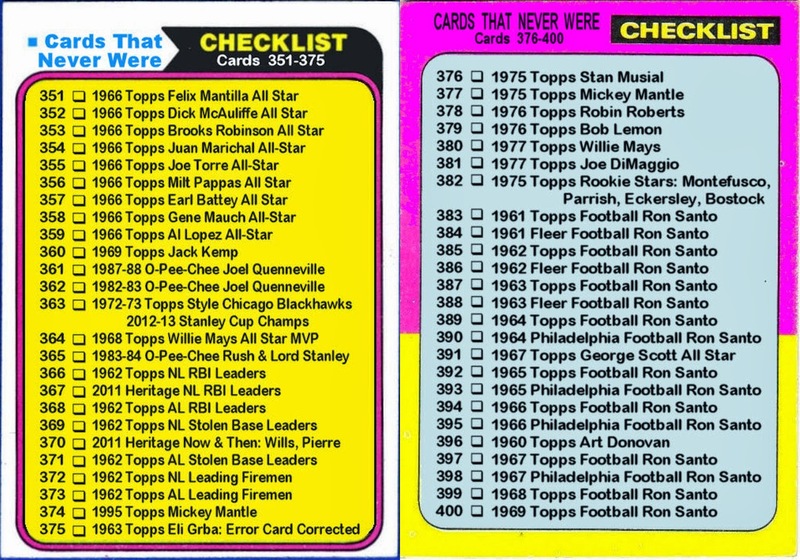 I didn't know whether I should put asterisks next to the steroid inflated records or ignore the steroid users completely. So I decided to do one of each. 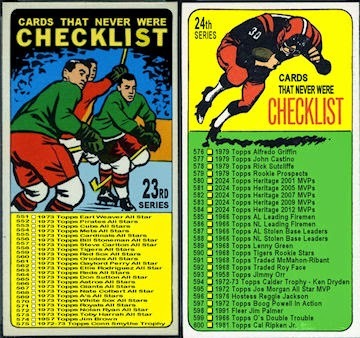 For the Rangers, I went 'roid-free, for the Cards I used the asterisk. 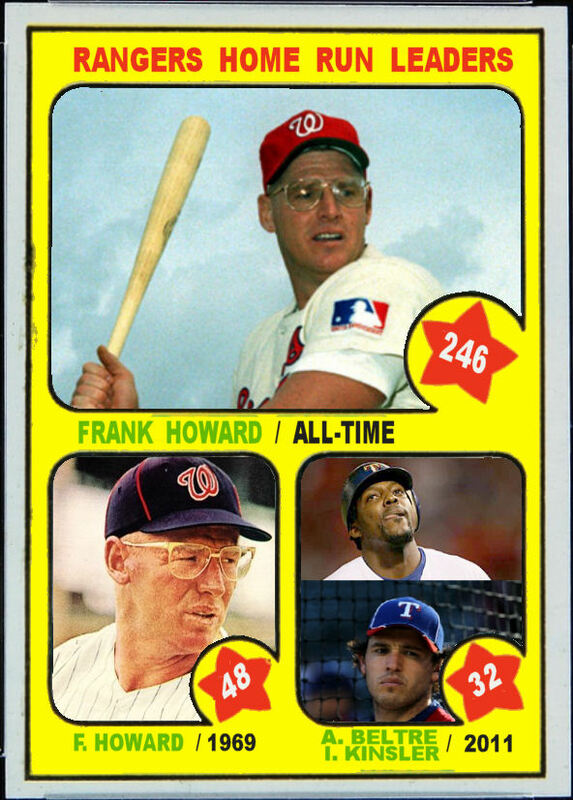 Frank Howard led the league in homers in 1968 and 1970 but his career best of 48 in 1969 was second to MVP Harmon Killebrew. Alex Rodriguez hit 57 home runs for the Rangers in 2002 and 52 in 2001, the year he tested positive for steroids. He later admitted using performance enhancing drugs from 2001-2003. Juan Gonzalez has a total of 372 homers with the Rangers. Although he still denies steroid use, his trainer was detained by Canadian police for picking up a package containing steroids that he claims were for Gonzalez. Rafael Palmeiro had 321 home runs in a Rangers uniform. Of course we all remember Palmeiro vehemently denying using steroids under oath in front of Congress in March of 2005 then being suspended by Major League Baseball in August of that same year for testing positive for steroid use. Both Palmeiro and Gonzalez were also implicated by Jose Canseco in his book "Juiced". To include these 3 cheaters at the expense of Frank Howard, just feels wrong. 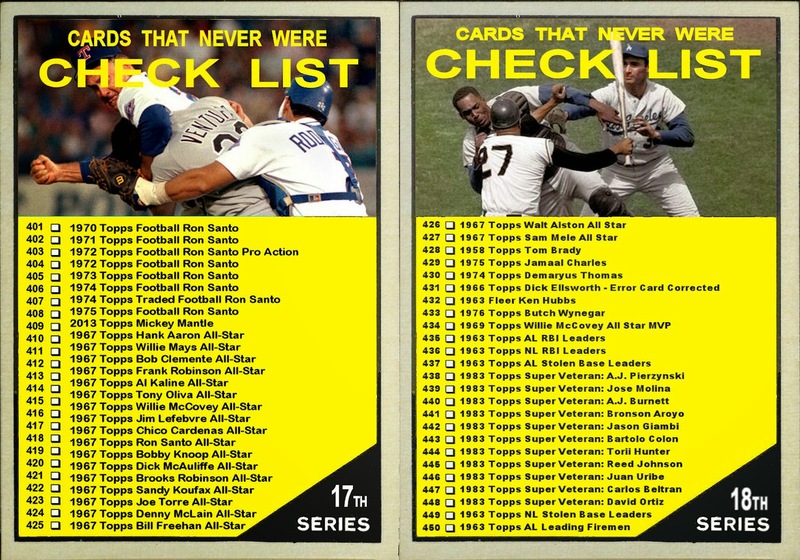 Adrian Beltre and Ian Kinsler both hit 32 round-trippers during the 2011 season. After Beltre led the league in homers with 48 in 2004, there was speculation that he used performance enhancing drugs, but it was based on opinion only with no evidence to back it up. Kinsler's 32 homers is a career high. He also stole 30 bases. This is the second 30-30 season for him. His first was in 2009 with 31 HR and 31 SB. 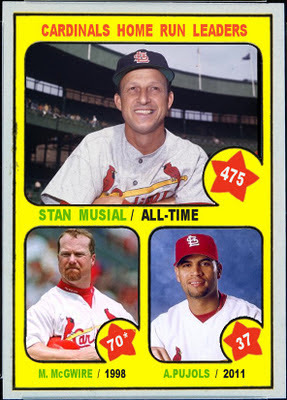 Stan Musial was a 3 time MVP and appeared in 24 All-Star games in his 22 seasons. 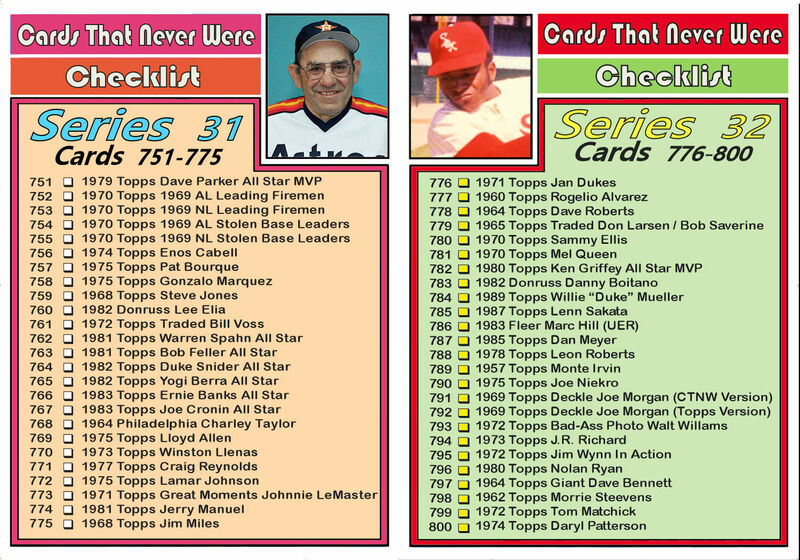 His highest season total was 39 which ties him for 13th in the all time Cardinals list. But it is his consistency and longevity that puts him on top. Mark McGwire hit 70 home runs in 1998. After years of denial he finally came clean. Well, almost. He claimed taking steroids for "health purposes". I don't remember where I heard it first but I'll repeat it. "Without steroids, Mark McGwire is Dave Kingman." Albert Pujols has never hit fewer than 32 home runs in any season of his 11 year career. He is at #2 on the Cardinals all-time list at 445 and should surpass Musial next year assuming he is still healthy and wearing a Cardinals uniform. He is also #3 on the single season list with 49 homers behind Mark McGwire's suspect totals in 1998 and 1999.